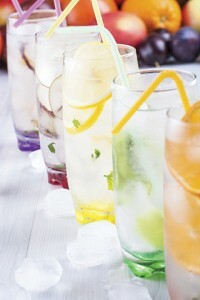 With the warmer months approaching, infused water is a great way to spice up the flavor of your water. Even kids think this is fun and cool! Many ready-to-drink “flavored” waters include a variety of the following: preservatives, artificial sweeteners, added vitamins/minerals, artificial coloring (Red 40, Blue1), sodium, sucralose, sucrose, high fructose corn syrup, dextrose and refined sugar. Why consume all of these “extras” when all our body needs is water! Infused water allows you to flavor your water naturally, and you reap the benefits of the fruits, vegetables and herbs added: antioxidants, vitamins/minerals, potassium, phytochemicals and natural flavor burst. Coconut water is also another great beverage to hydrate with because it contains natural electrolytes and healthy carbohydrates with no added ingredients or sugars. Wash, then thinly slice fruits and vegetables leaving the skin and peel on. For herbs, use the leaves whole or slightly torn. Add flavor combinations together in a pitcher or individual container. Amount is up to you depending on intensity desired. Let infuse for at least 1-2 hours or overnight.